OK, I've mentioned a layout that impressed me, now for something that amazed me. 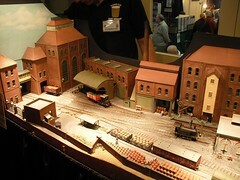 At the back of the NEC hall was a display of Faller Hit Train. 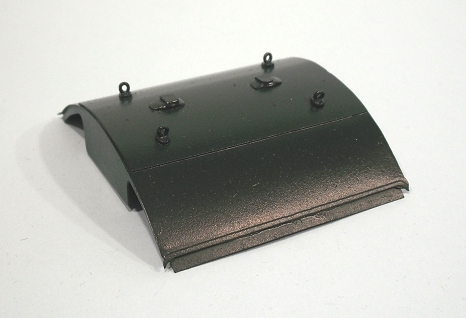 This is an O gauge plastic system made by Faller in the 1970's. 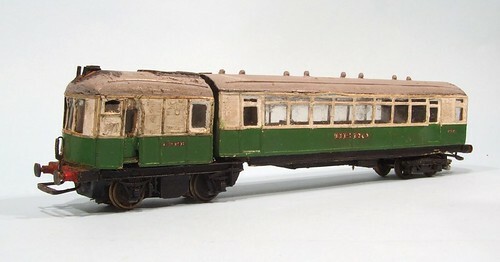 There were sensible steam and diesel models of course but somewhere along the line someone got creative. Just look at that electric locomotive. Have you ever seen anything like it ? Madness, utter madness. If I were a suspicious man I might think that the design process was carried out in a thick fug of sweet smelling smoke, perhaps in a Dutch coffee house. More information on this website. All I can say, is, Wow ! 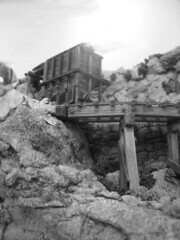 Every so often a model railway layout comes along that is inspired. Such is the case with Loek Bronkhurst's model "De Hazelpoort 1927". All weekend at the NEC it was difficult to get a decent look such were the crowds around it. Perseverance paid off though as the scene in front of you is fantastic. The model doesn't sound that exciting. There is a viaduct under which runs a steam tramway. 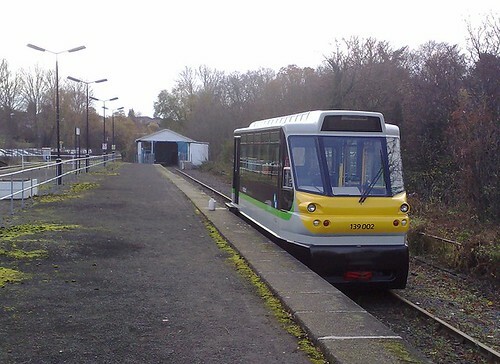 Trains process across the higher level and trams trundle along the lower one. At around 4 feet long it's not a huge model and this partly explains the crowds since you can't spread very far along it. The staging is great as the baseboard is very deep for its length and the scene is contained in a box so you have to look at the front. Although the standard of model making is extremely high, what excited the crowds were the cyclists. Real, working, HO scale cyclists. They cycled along the road and rough the bend, little legs pumping the pedals for all they were worth. The pedals are driven by clear disks and the riders lower limbs are brilliantly jointed. The bike is dragged along by a belt under the road with a magnet attracting little bits of steel which keep it vertical. Loek had to remove a rider at one point as it had stopped and he kindly demo'd the tiny model on a bit of card. All this was great but once I looked through the end of the model I spotted another clever feature. The trains don't work as normal model ones but are attached to an endless ribbon which drags them along the track. At the end they simply roll over a bit pulley at each end. The view is most odd as you can see from the video below. I was allowed inside the barrier to get a better look and it's amazing. The train travels upside down under the length of the layout until it returns to the start point. OK, the variety of rolling stock the visitor gets to see is limited, but then this is a "watching the scene" model and not a serious operational one. And I want to build one. That's a reasonable question from anyone after I mention I was demonstrating at the countries biggest model railway exhibition. The answer is, "As little as possible". A friend once explained that if you actually manage to build anything while you have been demonstrating then you are doing it wrong. The ideal demonstrator spends the entire day talking to the audience, imparting knowledge and helping the people who have paid good money to come in the door improve their enjoyment of the hobby. Some plasticard which has been partly coloured in to show the bricks. This isn't really results, just part of the explanation so doesn't count. A part built SuperQuick coal office. So, next time someone says that they will do a demo at a show as it's a good way of getting a couple of days modelling time it, you know to rota them on to selling tickets at the door. It's over. We left the NEC, drove home avoiding the idiot taxi driver without crashing. The stuff has been dumped indoors and we have drunk tea. 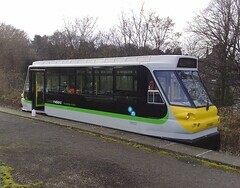 That was Warley 2010. First I should say thank you to everyone who dropped in and said hello. Apologies to those who wanted to and couldn't because of the crowds. Hello to new visitors to this blog too. Good to meet you and I hope you enjoyed the show. Keep coming back as I will be trying to post every day for your entertainment and education. I'm particularly proud of the badge I received. Most people just had the word "Exhibitor" on their badge. Mine had my name on it. I am special. For two days we talked ourselves hoarse explaining cardboard building construction. 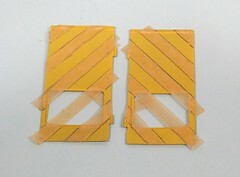 The story starts with SuperQuick kits and then moves on to scratchbuilding using DalerBoard and plasticard. Various buildings were present for the crowds to handle and possibly be impressed by . The market house went down particularly well as it's a very pretty building. Once we'd covered the kits, a couple of 3mm scale houses were used to explain the next steps. One of them is only half finished to demonstrate the techniques involved. 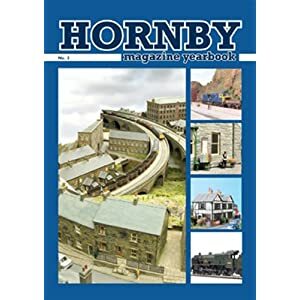 Finally the little hut I wrote up in Hornby Magazine was waved around along with a copy of the magazine so that prospective modellers would know where to find some simple to follow instructions. As a demo this went well. For much of the last two days we've had a decent crowd of up to a dozen people in front of our table. A couple get to sit down as chairs were provided, but many preferred to stand. 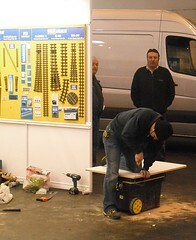 Best of all our stand attracted no smelly people despite there being one or two wafting around the hall. In fact with only a couple of exceptions, everyone was interested and appreciative of our efforts. Maybe they were just being kind. 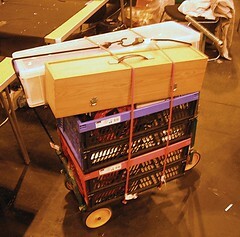 At the end of the day we managed to load all our stand onto a small trolley brought along for the occasions, and wheel the whole lot out to the car park. This saved all the hassle of trying to get the car into the hall which is always the worst bit of the event. Anyway, a really good weekend was had and we look forward to hopefully doing the same again next year. In the meantime, I've added to the photo gallery. 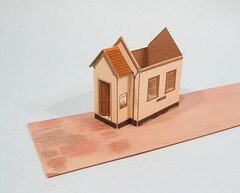 Who knew cardboard buildings were so interesting ? I'm more than a bit tired after spending the day explaining how wonderful SuperQuick kits followed by an excustion into scratchbuilding. Many people have now handled the lump of Daler Board we brought along and marvelled that its smooth, cheap and easy to use. Hopefully some will have even been inspired to go out and have a go at their own projects. Lots of blog leaflets disappeared, so if you are visiting for the first time, it was nice to see you at the show. On the right hand side (scroll down) under Labels, you will find the categorised posts. Click on a category and you'll get to read the story of that model. Admittedly this will be backwards (last posts first) but you'll get the idea. 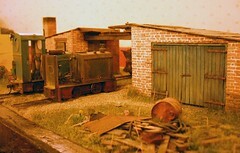 As a start, here are the posts for the little layout, Melbridge Parva, which was on the stand. This year we cracked it. Normally getting into the NEC to set up for the Warley Model Railway exhibition is challenging. There is a lot of queueing, getting lost in the road system, plenty of dodging other cars in the hall and a bit of a rush. This year because I'm working in the evening, we went early. Arriving at ten to 2 there was only a single van ahead of us so we pretty much drove straight in. The table wasn't far from the door so the stuff was dumped on it. I lost the car in the East car park and by the time I got back, my Dad had had added another NEC RCD test label to the collection on our lead. After a quick tidy up we went for a stroll around the hall. Before we left Trevor came over and picked up the G1 Class 14, which was handy as we were just looking up his position in the show guide ! All the magazines are close to each other and the Railway Modeller/Peco stand was next door. It seems that the other editors arrive later in the day, presumably in some sort of procession and definitely after the men with power tools have finished their work. To be honest, by 3pm there isn't that much to see so we hit the road again. After all, we have to back by 9:30 in the morning to greet everyone. So if you are heading to the show, please drop in at Stand E31 for a chat. I love a gimmick unusual working model. Which is why I made a special effort at the boat show to take some film of a slipway launched model of a Tyne class lifeboat. Make your own splashing noise. How green is my roof ? Cracking on with the Class 14, I'm having a few problems working out the livery. For example, most of the locos had a roof the same colour as the body. Except the one I have photos of, a preserved example, which has a grey one. There is also an interesting variation of black bits and green bits. This differs between machines too. Of course, you will be telling me to go and get a photo of a single loco and stick to that. Fine, except that the only one I have comprehensive coverage of is the preserved example, and I think that's wrong. 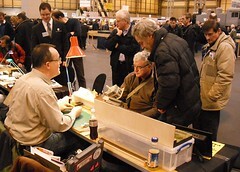 For the first time in a few years I was merely a punter at the model boat show. I paid to go in like everyone else, wandered around and didn't have to spend any time on the stand. There wasn't even anything I had built on display. "Must try harder" as my school reports used to say. My visit was on the Sunday, the last day of the show. The reasons were twofold; first it's quieter than the first 2 days which makes it easier to see things and take photos. Second, it's Remembrance Sunday which means the two minutes silence takes place during the morning. I personally believe that there is nowhere more moving to hold this important tribute. At a War Memorial or official service, everyone knows the drill and will shut up as expected. In a hall full of people who don't have to be quiet, the fact that everyone does is all the more moving. Anyway, the makeup of the show doesn't change - it's a mix of trade stands and model boats. Pretty much what you expect really. The traders appeared the same as last year with the addition of a bookseller. The boats, well to be honest I'd seen quite a few of them before. Since I have a terrible memory for this sort of thing that means they really have been along a few times. It's not that people don't build boats I suspect. The number of boxes walking out of the show would tend to mitigate against that; it's that if you have to travel to the show, you'll probably find the same people from each club will do this. The rest won't see the point or can't be bothered, hence repeated models. Not to worry, there were some interesting exhibits. I was on a personal mission not to buy any more project what with my nautical output being pretty much nil this year. There was temptation, the Marine modelling stand had a very interesting laser cut wood kit for a Pilot Boat (maybe next year) and on another stand was a large resin Thunderbird 4 which I certainly would have bought if it hadn't been a long discontinued model that the owner certainly wouldn't part with ! The Porters were built some time ago so I had to go and check the photos to work out the answer. Bacially, I didn't. The only change I made to the locos was the number on the red badge on the smokebox door. This came from a very old set of waterslide transfers picked up in the dim and distant past. It's nothing special, just a gold digit in a slightly fancy font. This isn't a job of Arial ! On the side of the boiler is a shield, but that's the original Bachmann one which I kept the paint off. Apart from this, nothing, just lots of dirt. However if I was going hunting for transfers, I'd start with EDM Models who retail this sort of thing. I'm sure they can help, or at least point you in the direction of someone who can. Another source might be the Slim Gauge Circle, these members might know some suitable trasfers. Hope this helps. You gotta love eBay. Sometimes the strangest things pop up on it. I have an alert set up for anything with the word "Hellingly" in it. Most of the time the results are platform tickets, maps or bits of Landrover. Once in a while though interesting items pop up. In this case, something from the model railway section. The seller has heard you need light for good photos but not that the light should come from behind whatever you are taking a picture of. While I can understand building the locomotive, scratchbuilding the tramcar is different. It's not the easiest thing to do and unless you are planning to build a model of the line, and I have that particular prototype sown up thank you, why would you want it ? Sadly I know no more. The models went for £57 which means someone has bought themselves a pair of second hand Tenshodo SPUDS for nearly the price of two new ones. I hope they models survive somewhere though. Since I'm spending the day at the International Model Boat show today, it seems appropriate to mention this rather fantastic story that appeared in the Metro newspaper a few days ago, and therefore probably on the BBC a couple of days later. Ed Diment used 250,000 bricks building this. Amazingly the story treated it as a perfectly normal thing to do. What amazed me is that it is grey. I mean when I built Lego as a kid, we never had grey bricks. Or brown for that matter. Whatever, it is a fantastic piece of work. I'm really envious, and not just because I've always aspired to being a professional Lego builder. 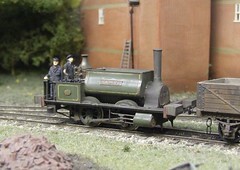 All my model railway layouts use Spratt & Winkle couplings. These rely on a steel chain that the uncoupling magnet attracts. 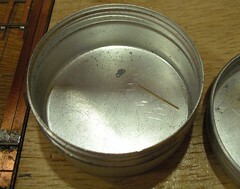 In 4mm scale I can use the stuff supplied by the EM Gauge society. 3mm is different though. 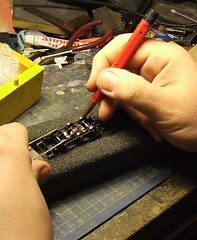 Here I have to make my own by winding wire around a bit of rail and then slicing through the coils with a piercing saw. Then each link is joined up and hung from the etched coupling. Occasionally the magnets do more than uncouple, they grab the last link on the chain. Once that has happened the things don't work any more - 3 links are required to be within grabbing range. Therefore I take the pot containing spare links to shows and replace as required with some long nosed pliers and a bit of fiddling in the fiddle yard. At the weekend I realised it's time to make some more chain up - my stocks are nearly exhausted. I'm back to searching the magnets for missing links, not all that successfully either, heaven knows where they go. Maybe the magnets are eating them ? 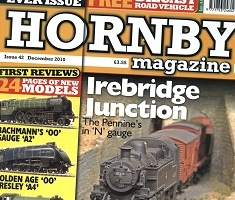 Through the letterbox arrives the December issue of Hornby Magazine, and it's a fat one. 169 pages in total. My contribution is the cheapest project ever, a scratchbuilt platelayers hut. Total cost of materials will be under a pound, just right for these "credit crunch" times I hope. The prototype is one I've built several times, from the Ericplans book the real thing would have been found at Wadborough in Worcestershire. I can't recall if this is the first 4mm version from my hands but I know I've had a go in 7mm and G scales. It's nicely propotioned and I think looks different from anything kit built or available from RTR sellers. In an effort to keep the cost down as far as possible, the slates are made from paper. To do this I marked out some on a sheets and made this available from the new downloads area of my website. Elsewhere, Melbridge Parva makes an appearance in staff projects with me attacking a Hornby building with a saw. These things aren't finished items you know, they are just raw materials ! 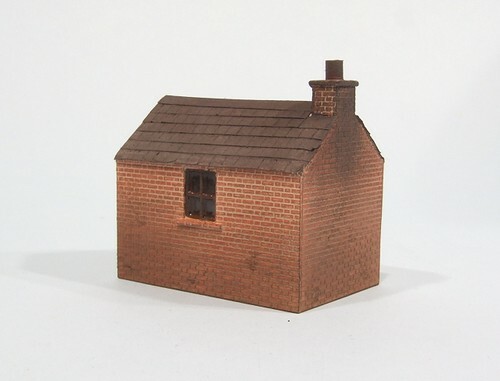 Incidentally, if you fancy a look at my 7mm version of this hut, you can read about it here. Spotted on Mytchett Green, a rather nice model tramway at Wycrail, were these excellent cobbles. Only someone who has tried to build inlaid track can truly appreciate how well these have been done. The lovely flowing trackwork is scratchbuilt from PCB sleepers to which has been soldered the rail. 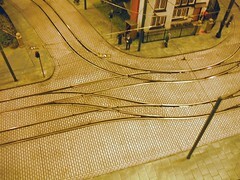 Everything has been checkrailed and would need to be even if it wasn't cobbled as the curved are proper tramway tight. 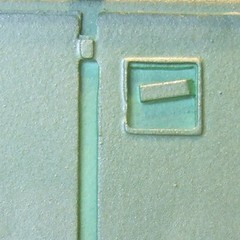 The inlay is Metcalf cardboard cobbles very carefully cut to fit. The thickness of the car brings them up to just below the rail head - ideal when you clean the track with a rubber. I'd never have thought of that but I would now. 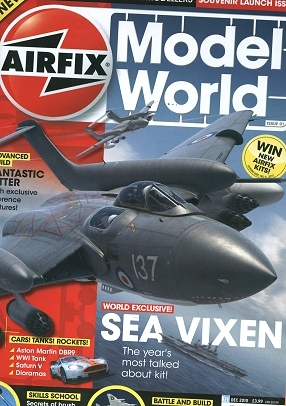 Being a sucker for issue 1 of new publications, I grabbed the new Airfix Model World Magazine as soon as I saw it. Matt Irvines blog had mentioned it a few days ago so I was prepared and picked up a copy while buying "Practical Classics". Did I mention that I have a photo in the later ? Anyway, Model World is the spiritual successor to the long lost Airfix Magazine although it's also a close relative of Tamya Magazine I suspect. There are quite a few publications aimed at the plastic kit fan nowadays so I wonder if there is space in the market, even one with such an important name in the hobby. The content seems to be primarily aimed at aircraft, military and car modellers. Presumably this is because railway and boat modellers have more than enough stuff to read every month. The days of one magazine covering the entire model making hobby (hang on, there's an idea for a title...) are long gone. We prefer to specialise nowadays. Readers don't want one piece on their favorite topic and the rest of the pages on other peoples hobbies. Reading web forums, even railway modellers don't want one page on their own scale/gauge/era and other pages on things that aren't perfectly aligned with their interests. Of course, I rise above all this and like to read and pinch ideas from everywhere. With this in mind I was really interested in the article on painting a WW1 tank where materials and techniques new to me are revealed. The MIG mud looks particularly interesting. Most of the articles cover aircraft. They all look a bit like, well aircraft to me and while interesting, don't break any new ground. All look very nice I suppose, apart from a classic Spitfire kit which suffer (to my eye) from over-dark panel lines. The Saturn 5 rocket is useful and pleasantly critical of a product from the magazines namesake. Production quality is very high, the photos are well reproduced. The layout is easy to follow although someone should have proof read the article on a vac-formed building so they didn't repeat one of the steps on consecutive pages. There's quite a lot of prototype information. If you want to build a Sea Vixen then there's a load of stuff for you. Will I buy another copy ? Probably not, there are too many boat, train and classic car magazines (some with excellent photos) to fill my life but if there's something in there that interests me, or a project I might have a crack at in the future then you never know. Anyway, all that is lacking is inspiration and time. The later looks to be getting easier in a couple of weeks and while there is a still a pile of projects in the queue ahead of the layout I thought I'd do something about the inspiration part of the problem. EDM Models send out a newsletter and in the last one I spotted there was a meeting of the Slim Gauge association, a group interested in modelling narrow gauge American railways, about half an hours drive away. "Got to worth a look" I thought. Having tracked down Bilton Social Club, I found the entrance around the back of the building and wandered in. Behind the desk it signatures of members and guests were being collected. Members were also presented with a sticker showing their name - an excellent idea for any group where they will only meet virtually. I could have gone in for free as a guest but decided to leap in with a fivers worth of membership money. In the club it was mostly sales stalls. This took a little while to get my head around. Reading the newsletter it seems that people can come along as sell things which leads to what has been described as a marketplace. Not knowing anyone though, this helped as I could poke around and chat at the same time. Of the larger traders, EDM models was present with a huge range of products. There were a couple of layouts too. One appeared to be Sn3 and far too clean for my tastes. The other though was just what I was looking for. 30 inches by 14 of roundy roundy. In the middle of the circuit is a mine loader, again, just what I am planning. The biggest difference is that this layout is 5.5mm scale and I'm going for 7mm. The track gauge is the same though. And I have at least twice the length and a bit more width available for my model. Elsewhere a modeller of European prototypes was showing some very nice little industrial buildings. The brickwork is fantastic due to the fact it is real. He casts his own bricks in plaster and lays them in the same way as a real brickie. This must take hours but the slightly uneven courses give the walls loads of character. Finally I spotted a G scale wooden hopper wagon. I want one. 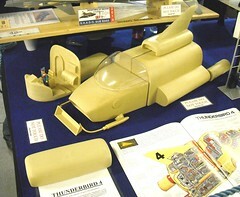 And I want it in 7mm scale. And the nice man who built it let me take photos and told me how he stained the wood - a mix of black, brown and emulsion which you dip the basswood into and let it dry. Great stuff. We don't normally do one day shows nowadays. It's not that we're too stuck up to go to shorter shows you understand, it's just that as the only driver on the team, I don't like hammering down the motorway, setting up, playing trains, packing up and then driving back. Makes for a loooong day. At least two days means only one driving session per day. Anyway from an exhibiting point of view, the extra day requires no more extra work than a track and wheel cleaning sessions. High Wycombe is only an hour away and so we made an exception. Actually I can't remember how we ended up booked in but I'm glad we did. The journey was fine apart from getting lost between the motorway and venue. We tried three exits before finding the right one. Thanks to random man outside a newsagents to helped out when we stopped to ask. Despite the delay we were still wandering around the show having set up 20 minutes before it opened. It was a good job the wandering was done early too as after a slightly slow start, the crowds kept coming. Walking around in the morning was difficult, the lunchtime lull never happened and even at 4pm there were still plenty of punters in the hall. Much of this must be down to the quality of exhibits. This was higher than many major two day shows and certainly the best one day I recall for quite a while. I'll certainly be looking at the list next year to see what's occurring. Trade wasn't bad either with a good mix and just enough RTR to keep everyone happy as well as a selection of more specialist sellers. Of the layouts, the one who wins "Layout Phil wants to build" from the weekend had to be Egypt Brewery. 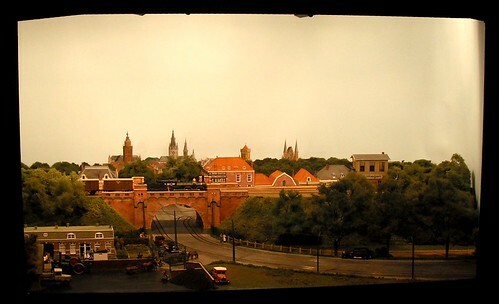 This is an absolutely tiny model with great big buildings (it's a brewery obviously) between which, industrial locomotives are scurrying around. The presentation was nice too, something easily overlooked if you just want to build a little layout. Elsewhere you could see Mr Nevards rather nice Comwich which shared trains with the adjacent Bleakhouse road thanks to a handy bit of cassette fiddle yard carried between the two models. Ingenious and I think, unique. You can read more on his blog. On the cake front we managed to bag some excellent chocolate fudge cake. The sponge was nice an moist with a creamy topping covered in bits. This was mid-morning and by the afternoon supplied were exhausted. Others have photographed different cakes which apparently also very good. It goes to show that people don't come for the trains, they come for the confectionery. If I have a complaint, it was that there were a higher number of smelly people than you find at shows. I'm not sure if this is more prevalent in the south as there haven't been any at shows closer to the north pole this year. Maybe they were congregating specially for this even. Is there club called "The Great Unwashed" ? Is mini video a good idea ? While I was at the Large aircraft show, one of the traders was selling micro video cameras. For 50 quid you get a tiny little camera that records on micro SD cards. It looked interesting so I took a leaflet. Back home it turned out that despite selling a device who's output is going to end up on teh Interweb, the seller doesn't have a web site ! In fact it turns out there are several versions of the same device. A cheap plastic one and a better version in a plastic case for about 20 pounds or a better version in an alloy case for 50. Better still there is a video taken from a radio control glider. Which shows that the quality is pretty good. At this point I'm thinking that this looks like a lot of fun. I should have one. First thoughts turn to model boats. How about some shots taken at water level ? Maybe I could fit one to a Slingshot and film a race from within the action ? Maybe, but would it work ? Think about it, when you are in a car do you stare straight ahead ? No, you turn to look around corners. Film makers know this and swing the view around. To get a decent bit of footage I'll need to do something similar. Some sort of linkage driven from the rudder might be possible but this means the camera needs to be built into the boat rather than fitted as required. This is all sounding like work. Next up, how about filming model railways from the point of view of the driver ? Again, technically possible. If you look at the end of the glider footage the grass is in focus so the close-up capabilities are OK. 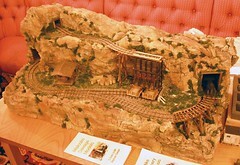 But, and it's a big one, model railways are built like stage sets. You look at them from the front. Any other viewpoint and all you'll notice is the audience. The actors on stage and telly aren't in an immersive environment and our train sets aren't like that either. The results will be a bit rubbish. So; 50 quid saved then. 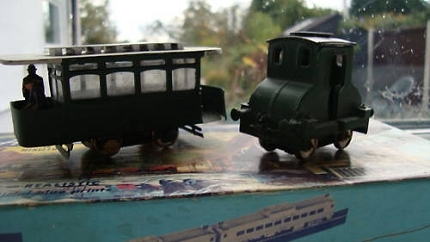 I've recently bought a High Level kit of the Neilson 0-4-0 and have come to the conclusion that you are the only modeller on the entire planet who's published his experiences of building the kit on the internet! I have, therefore, devoured every word of your write-up and approach you for a little advice before commencing construction of my own version. My first and more mundane question concerns the wheels. High Level simply offer a Sharman Wheels reference number which, with Sharman Wheels having ceased trading, is obviously now meaningless. I think the wheels should be 14mm/3'6" diameter. Am I right? My second question is about the cylinder assembly. You comment on the need to anneal the cylinder wrappers and say that if you were doing it again you'd do it a different way. So how would you do it? I am in the final stages of not-quite-abandoning/having-a-break-from a particularly nasty Peter K kit of a 'K' Class Manning Wardle that, amongst many shortcomings, was etched from brass that was far too hard to dimple out the rivets in the usual way. The only reason I've got as far with it as I have is because I was given a crash-course in annealing (By Chris Gibbon of High Level, ironically enough) so total avoidance of annealing with the Neilson's cylinder wrappers will (hopefully) not be necessary. Wheels - I used Romfords rather than Sharman. 14mm sounds about right to me (the loco isn't handy to measure) but a quick call to Mr Gibbons would probably get the answer. I recall that there is a plan in the instructions so perhaps you could measure this ? If you are working in OO I can't see any reason to use anything other than Romfords unless you need a weird wheel. As someone who is hopeless at making chassis, I like to be able to put them on and take them off again a few times in the process. Hope this helps. Don't be put off by the Peter K kit. 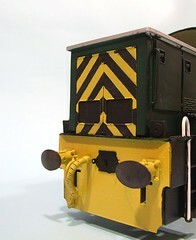 His models are notoriously for the more advanced modeller, but fill a gap in the market. I have a Furness engine from him tucked away in the "oneday" box. It looks a bit scary but I reckon I could manage it, but then it will have been a long while from purchase to building ! 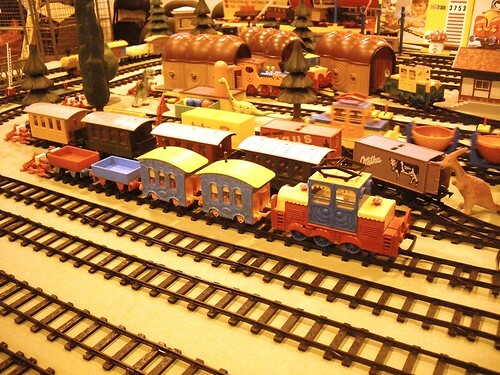 At all model railway exhibitions you need a "crowd pleaser". Something that the general public will appreciate and ensure that they feel they have had value for money from their ticket. Usually this will be a nice big roundy-roundy with trains thrashing around at breakneck speed, although at Scaleforum something along the lines of a perfectly modelled branch terminus featuring 1 train a day is perhaps more appropriate. Anyway, at next years Leamington & Warwick show we have picked something a little different - Stanley Midland. You see we have a big hall to work with and so can chose those models that won't normally be seen at average exhibitions. In this case some Gauge 1 live steam. What I love about this layout is that there is aboard in the middle that people book their models on to. This ensures that there will always be something running at all times - just right to provide consistent entertainment. Better still, the models are all superb examples of model engineering. In the past we've gone for vintage or even Playmobile models which are great but not really of interest to the serious modeller (as opposed to the collector) whereas you might be a flange fascist but you can't argue with the workmanship on display. The film above was made on the Tuesday of the Midlands Model Engineering Exhibition, hence the light crowd hanging around. We'd never have got the footage on the Friday ! 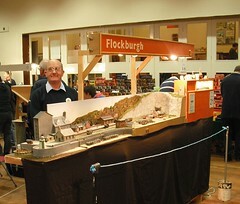 This weekend we'll be taking Flockburgh to Wycrail. Since it's a one day show I suppose I'd better be ready before we leave and that means a good dose of wheel cleaning and finding out what broke last time. Maybe I'll even fix it ! Since the venue isn't very far away we'll do the who thing in a day too - travelling down, setting up, playing trains, packing up and driving home. I'm not a big fan of this sort of thing as the only driver on the team 'cos it makes for a very long day but I suppose it will be OK. The main thing is that this looks like an excellent event. The layout list is pretty impressive so we should be in good company. One day shows can be a bit difficult to attract exhibits to so I can only assume that the quality of the cake on offer is truly outstanding. I have had passed on to me a more or less mint and definitely complete GEM 56XX '00' whitemetal kit - I happened to mention I'd never made a kit but fancied giving it a try and hey Preston. I think I'll be ok with soldering iron and/or glue, having built and electrified several static layouts, but am worried as in not quite panic struck about the chassis and electrifying the loco as this would be totally new ground for me. Frankly I wouldn't know where to begin. Is there a source of rtr chassis and could I butcher one to fit? Or am I better off saying 'That which does not destroy me or at least glue my fingers permanently to the modelling bench makes me strong' and getting hold of a chassis kit (?) and motor gears etc (?) and having a go? If so, wherefrom? Oh the joys of your first locomotive kit. I remember back in the good old days nervously poking soldering irons at bits of metal, terrified that I'd only produce some mangled metal covered in solder. First up, the RTR chassis option: Forget it. If you are doing this you might as well buy a Bachmann loco and save the grief of building the kit. Making the kit fit the RTR chassis, which might be available as a spare, won't be easy either since it will means carving away whitemetal to clear the motor as well as figuring out a way of attaching body to underpinning. My suggestion would be to go for the full on kit approach. I can't vouch for the quality having never seen one, but Kit Connection claim to produce something for this model. At 19 quid it's not expensive BUT of course you will still need to buy motor, wheels and gears. I'd suggest Romfords and something from Branchlines in the way of motorising gear. Yes, the cost will be more than the Bachmann model and you need to get over this I'm afraid. As you say, what doesn't singe your fingers too much, makes you strong. Get the first loco over with and you'll find that you can build anything you want. Yes, there will be frustrations and you'll need to put the model aside and come back to it more than once. In the end though, there is little in this hobby to beat watching a loco you built running up and down. I know I keep saying this but it's true. Anyway, you'll be wanting some chassis building tips. I can only refer you to an old blog post which I think will help. Good luck. If you go down the route I suggest, feel free to chuck more questions my way and please send photos of the model. And please don't hurt anyone who says, "Is it Bachmann mister" too much will you ! Dark green paint has appeared on the cabside door ! Obviously when I peeled the masking tape off a couple of weeks ago, some of it or a painty finger, touched the door leaving a mark. I couldn't be bothered to repaint so decided to try and remove the problem. Annoyingly I searched for a bottle of T-Cut but couldn't find any. I reckon the cats have stolen it. Determined to get the job done I tried some Brasso wadding which being a mid abrasive, quickly removed the mark. I need to clean the residue off with a cotton bud and some water but apart from polishing up the door, it worked pretty well. Returning the Class14, I really have to stop kidding myself. 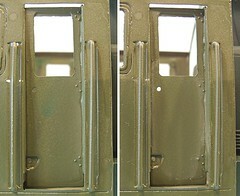 Despite covering the body in an entire jar of green paint, there are still areas where the primer is showing through the paint. In this case that the photo actually looks better than the real model - the contrast doesn't show quite as badly as in daylight. Anyway, a new pot of green and I've touched in the corners and other areas that need a bit extra pigment. The areas between the engine bay doors are still a bit light but a light wash of weathering will sort this out.